The Keau’ohana Native Rainforest Restoration Project now has its own website! We’ve published our 2018 Report with a summary of our activities this year. Thank you for your support, which allows us to do the work we do! 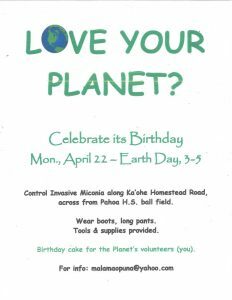 Malama O Puna is a Hawai‘i non-profit corporation and 501(c)(3) volunteer service organization which focuses on the environment. Our mission is to assure critical habitat for native species and open space for future generations through environmental education, hands-on projects, advocacy, watch-dogging and land trusting. Please browse our website to learn more about what we do and like us on Facebook to receive announcements about our upcoming events! Join us the second Thursday of each month at 6 PM for a free film screening followed by casual discussion. Free popcorn! Optional: bring food for yourself or to share. 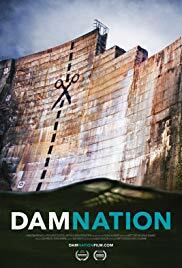 May 9: DamNation — From big dam engineering & world conquest…to knowing ourselves as part of nature, bound to the life & health of rivers. 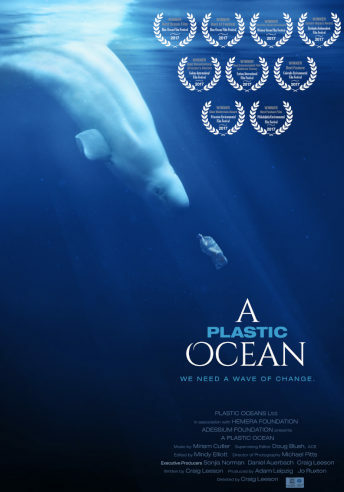 June 13: A Plastic Ocean — Scientists & the puzzle of plastic pollution: the consequences of our disposable lifestyle on what should be a pristine ocean. 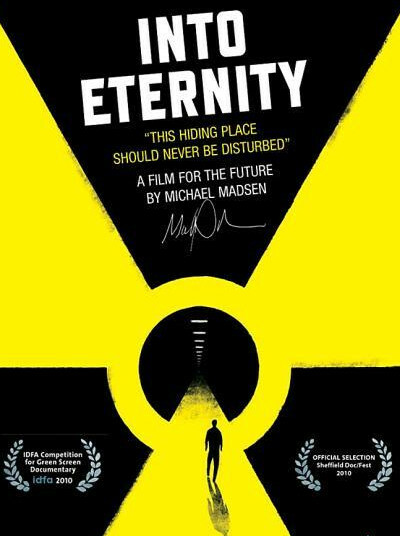 July 11: Into Eternity — Preparing a vast Finland bunker for 100,000 years of nuclear waste storage. Will this be our society’s final awful legacy? 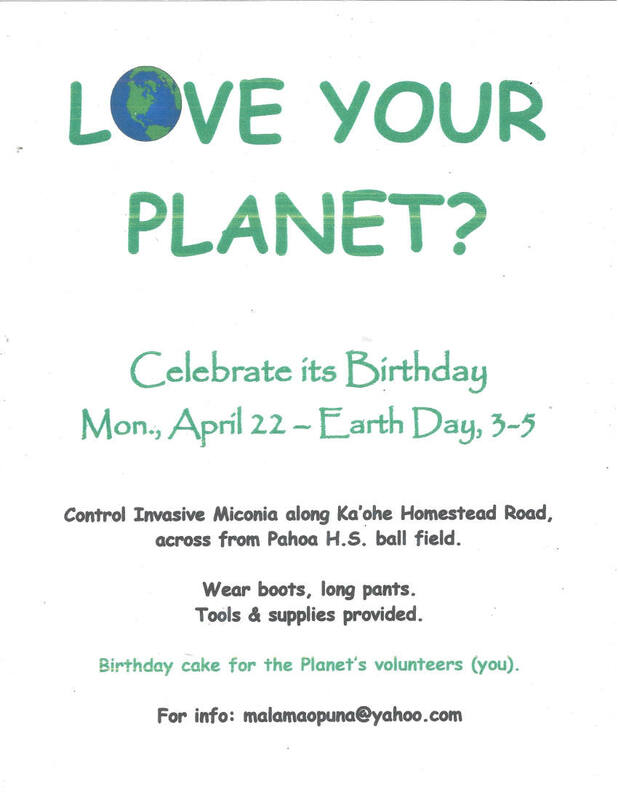 Where: Kaohe Homestead Road, across from the Pahoa High School ball field. 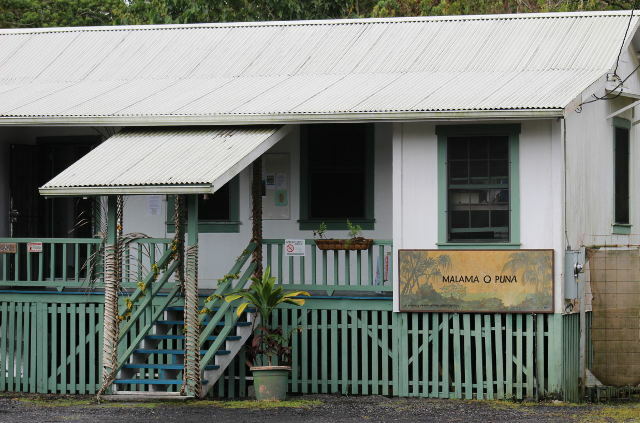 Stop in at our office in Pāhoa to use our Environmental Resource Center or just to say hi!